The plants in our large witch hazel (Hamamelis) collection do not all bloom at the same time, nor do they always bloom at the same time every year. Bloom time depends heavily on weather. The common witch hazel (H. virginiana) peaks between mid October and mid November. A few of the spring-flowering witch hazels can start blooming by the end of December or early January depending upon weather but peak occurs between mid January and mid March. Early March is a good time to see many in bloom. Blooming of most cultivars has finished by mid- to late April. A brisk winter walk through the Missouri Botanical Garden can be gratifying when you know for what and where to look. Eastern witch hazels typically bloom from late October to December. 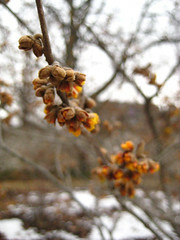 The majority of vernal (Ozark), Chinese and Japanese witch hazels typically flower sometime from January into March. The intermedia witch hazels are hybrids resulting from crosses between the Japanese and Chinese species, and in an average year at any one time, Garden visitors will find the greatest number of witch hazels in bloom when the intermedia hybrids flower, usually sometime from February thru mid March. Of the different types, Eastern and vernal arguably have the best fragrance. For the most part, the intermedias have the brightest fall colors and the largest flowers, but the least fragrance. Look for our witch hazels in the Jenkins Daylily Garden and just outside the fence surrounding the Doris I. Schnuck Children’s Garden. There are also many specimens in both our English Woodland Garden and Japanese Garden. 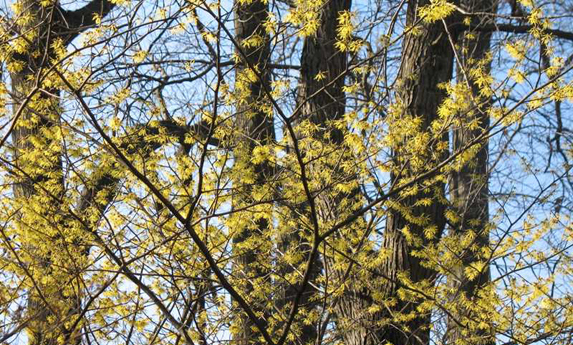 The hazel family, Hamamelidaceae, is comprised of over 100 species of trees and shrubs, including winter hazels, ironwoods, sweetgums, and the witch hazels. From this family, the Garden exhibits not only species types but also hybrids; in total there are hundreds of winter-flowering witch hazel (Hamamelis spp.) shrubs throughout the grounds. H. mollis, the Chinese witch hazel, has a long bloom period (January through March) and has quarter-sized yellow flowers that are less likely to be fragrant (an exception is ‘Goldcrest’). The Japanese witch hazel, H. japonica, blooms February through March and has more fragrant flowers. Hybrids between these two species (Hamamelis x intermedia) tend to be more showy, with long-lasting, moderately fragrant blooms. The Garden grows numerous named cultivars. Notable for its fall color, fragrant yellow flowers, long bloom time, and narrow profile, ‘Arnold Promise’ can be seen in both the Daylily and Woodland Gardens. Cultivars such as ‘Old Copper,’ ‘Aphrodite,’ and ‘Rubin’ produce warm-colored blooms. An extremely late-flowering hybrid, ‘Orange Encore’ can bloom through April, before leafing out. The Garden cultivates two species that are native to North America: H. virginiana and H. vernalis. The eastern witch hazels (H. virginiana) tend to bloom in the fall, with fragrant rust-colored flowers. On the other hand, most vernal witch hazels (H. vernalis) bloom in late winter, often whilst retaining their leaves; the Garden’s earliest blooming Ozark witch hazel is ‘Christmas Cheer,’ on display in the Daylily and Woodland Gardens. Readily accessible examples of Ozark witch hazels are in the Martha Love Symington Missouri Native Shade Garden at the Kemper Center for Home Gardening, with branches near the path for those curious noses to sniff out the winter-fresh fragrance from the dime-sized flowers.